I’ve kicked around the idea of book ornaments for about a year and I’ve finally decided to make a move in time for Christmas. 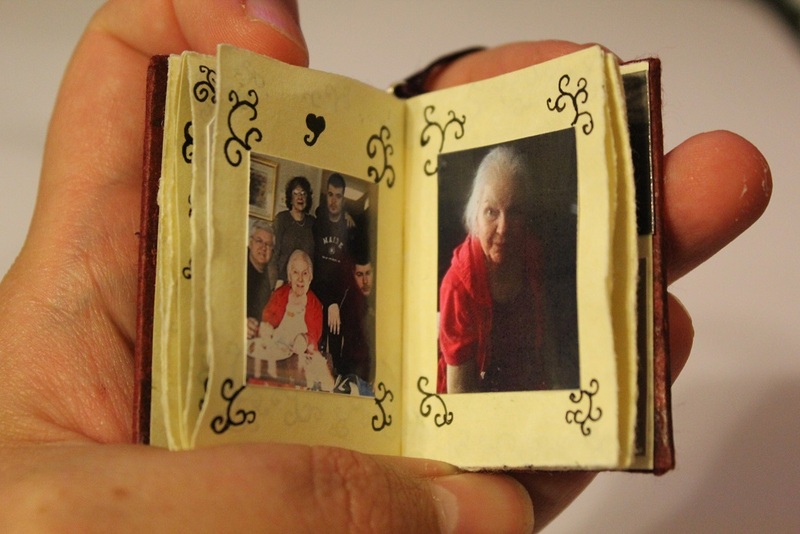 They can be made up with any theme but I prefer them as memorial keepsakes as sort of a way to keep loved ones who have passed close during the holidays. In March I made two for a friend and her sister after they lost their brother suddenly, because a sympathy card felt entirely inadequate, and in September I made the one I had been planning to make for myself for all the months in between. Below I have posted the photos of the ornament I made of my Busha explaining the concept a bit and hopefully I’ll have some blank ones available in my store soon. We lost Busha in 2013. She was my great grandmother. First I made the book and secured a ribbon loop at the top. 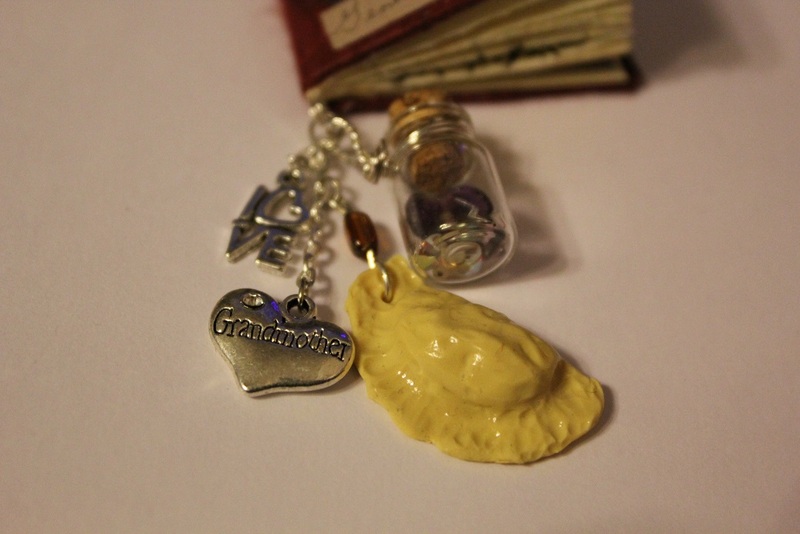 I added charms to the bottom loop of the book that were meaningful to me including a little pierogi charm I made as well as a bottle that I filled with gems from some old damaged costume jewelry that once belonged to her. 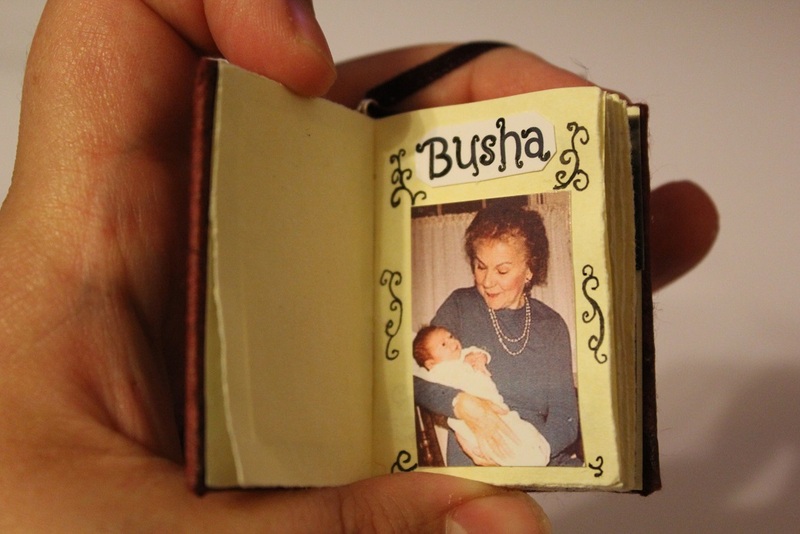 Then I gathered as many photos as I could find of my Busha and I printed them out as thumbnails. I also dug out some old cards she had given to me for various occasions and scanned copies of her handwriting. Handwriting to me is very special, it’s like a fingerprint. 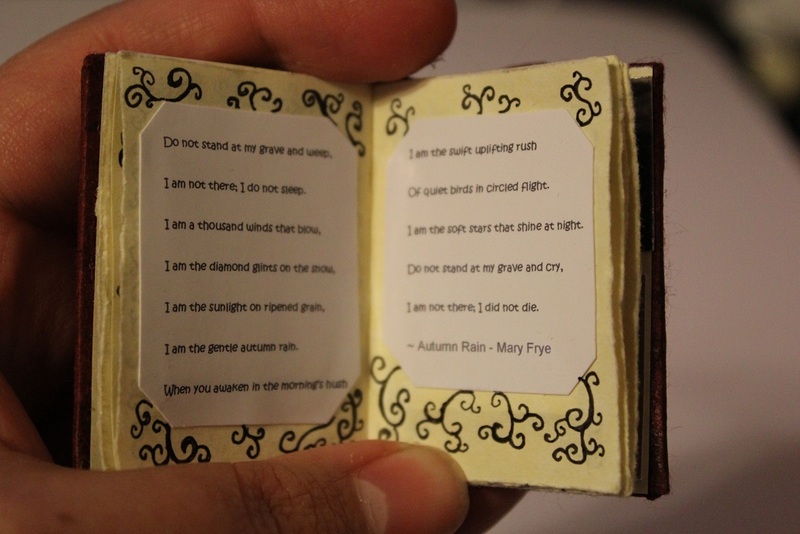 The last thing that I printed out was a tiny poem, Autumn Rain by Mary Frye, because it’s very beautiful to me, especially in context. 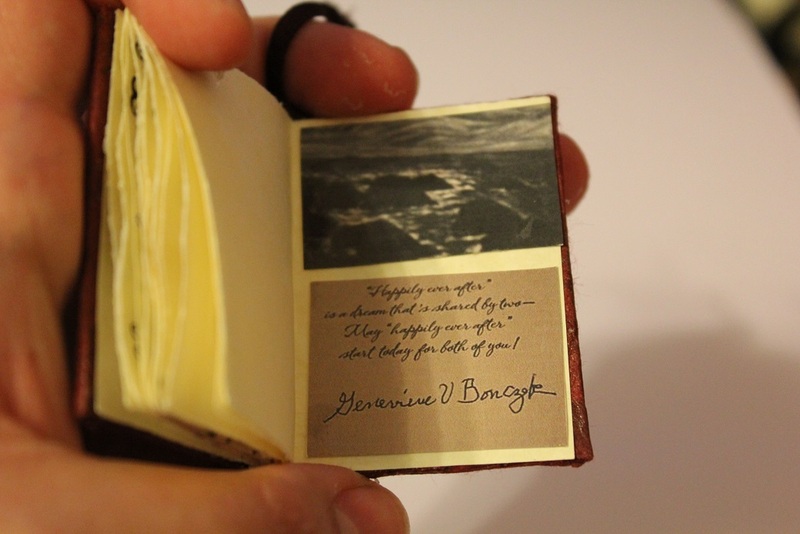 Once I had all of the components I basically made a scrapbook out of the tiny book by gluing in the photos and the poem. I filled int he empty spaces with free handed doodles because it felt appropriate. My Busha was an artist. In the one that I did for my friend I used layers of different colored papers to frame the photos and I included more sympathy and family quotes in the pages. The creative possibilities are endless in what to include in one of these ornaments and how to arrange the components. It’s all down to preference. It’s actually still a work in progress because I’m waiting on digital copies of some specific photos I’m unable to acquire myself to ad in. I also found a photo that contained one of her paintings which I managed to print out in thumbnail to add to the ornament. I am really happy with the way that it came out and I look forward to hanging it on my Christmas tree every year. It was actually a very emotional process putting this together but in the end I have a truly unique keepsake. 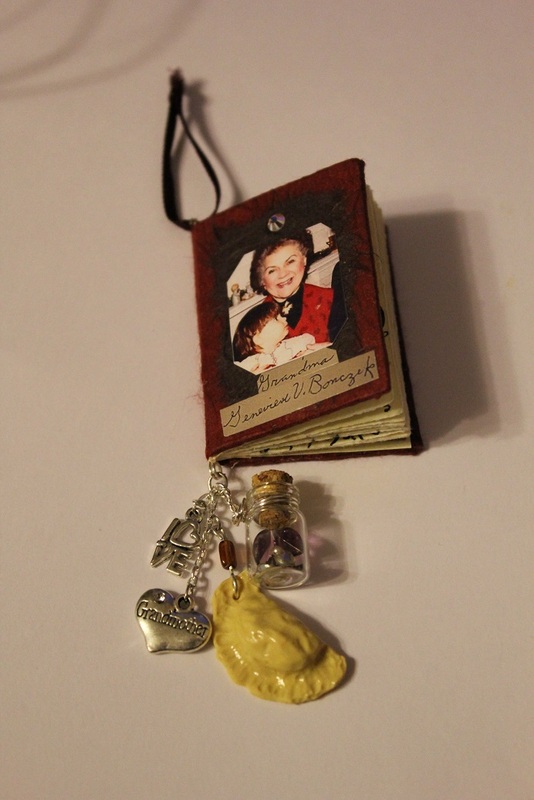 I’ll post on my facebook store page once the blank book ornaments are available for purchase. Each one will come with charms on the bottom, including an empty tiny corked bottle for an extra special memento.